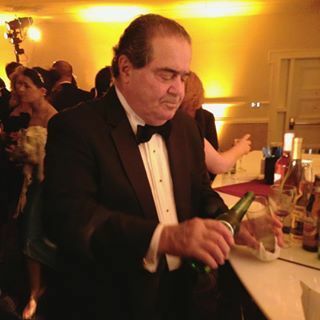 Ginsberg on Scalia 2008: “He's so utterly charming, so amusing, so sometimes outrageous you can't help but say I'm glad that he's my friend"
Justice Scalia: "I and my court owe no apology whatever for Bush versus Gore. We did the right thing. So there!" 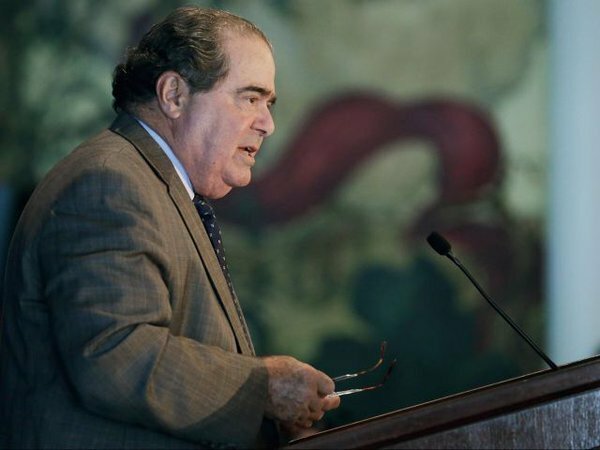 We honor Justice Scalia, an intellectual giant who dedicated his life to the Constitution. Keep his family in your thoughts & prayers. Hey, McConnell: Obama isn’t “allowed” to appoint Scalia’s replacement. He’s constitutionally empowered. And you don’t get to say otherwise. 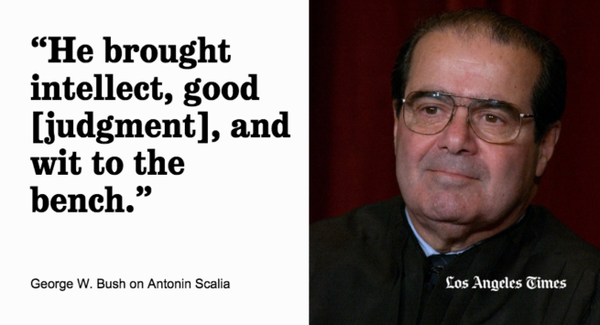 U.S. District Judge James Shadid tells @andykravetz Scalia "was articulate and wrote with razor sharp clarity. Never blurry." As Obama looks for cooperation & "bipartisanship" to replace Scalia, remember that Obamacare was rammed thru w/o a single Republican vote. 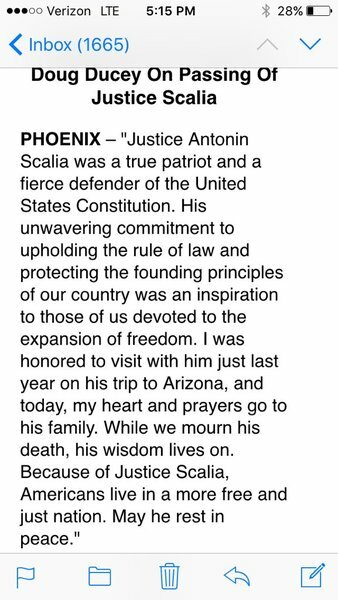 I am saddened by the news of Justice Antonin Scalia's passing. A respected steward of our Constitution, he leaves behind a lasting legacy. The Supreme Court never lost integrity&decorum. 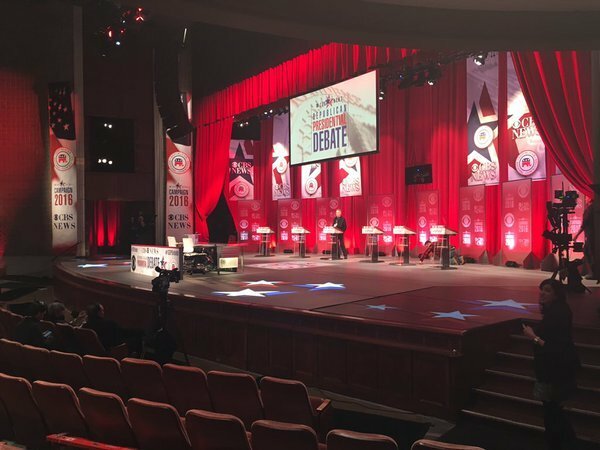 Passionate debate never went beyond the substance. Justice Scalia was integral to this. RIP. 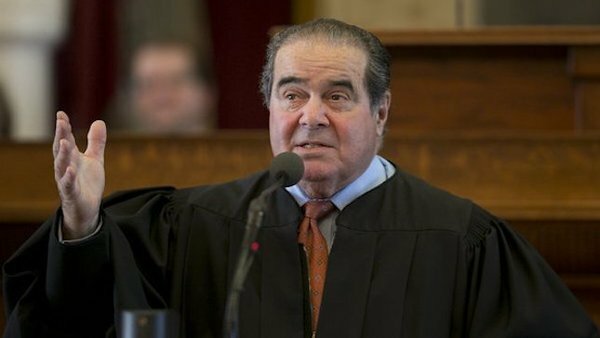 Trump on Scalia: "Massive setback for the Conservative movement and our COUNTRY!" Obama should nominate Judge Mathis to replace #Scalia. Since congress is going to reject whoever he picks, he might as well have some fun. 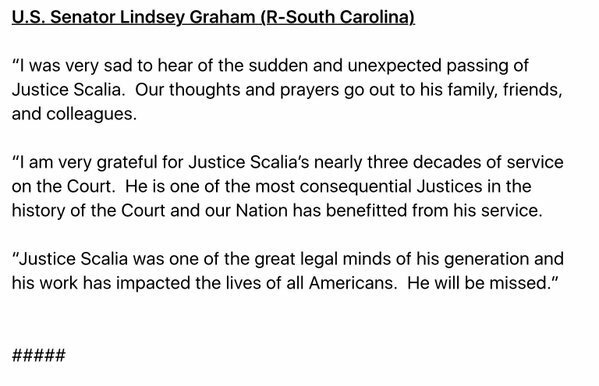 It's very reassuring that no one is prejudging any nominee for the Supreme Court and that Scalia's death hasn't become a political football. In 2007 I bumped into Scalia & a friend snapped our photo. But it was on telephoto by mistake! So all I got was a close-up of Scalia's CHIN.